It's always a frightening thing to take a leap and follow your heart. Almost always. Change is hard. You know it's the right thing to do, but you have reservations. My advice? Don't. 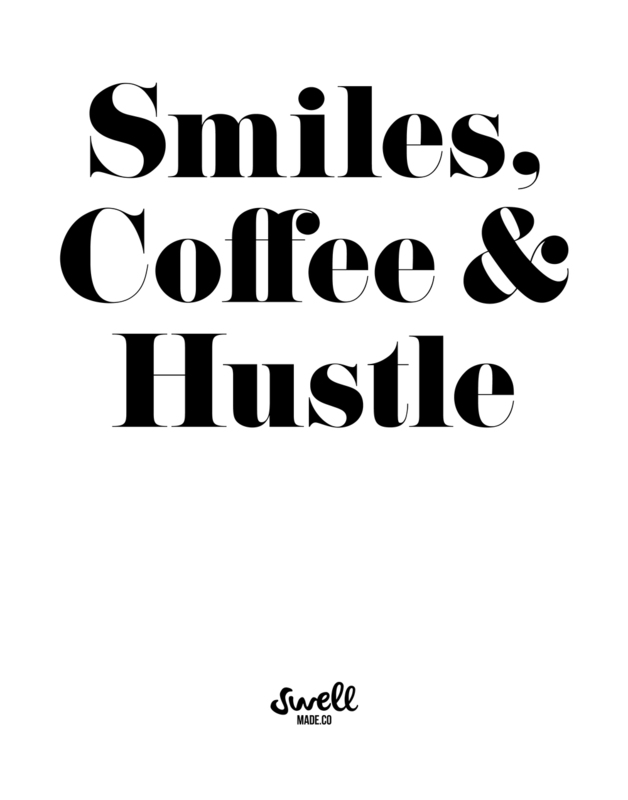 Follow those dreams, smile and hustle (and drink coffee or whatever fuels you). Good things are bound to happen. Swell Made Co. is one year old! It's been a wild, but very rewarding year. I started Swell Made Co. in November last year (2014). I stumbled a bit late into the holiday season. It was a strange time of year to get into the business, but it was one of those "now or never" moments, so I jumped. No regrets. After ringing in the New Year (2015), I was reading a horoscope that claimed my business venture would takeoff off in the fall. It also claimed I would meet a woman and we would see much success together. While, I'm not huge on horoscopes there might be some truth to that. Things have been taking off this fall; but, I haven't met one single women in business. I've met so many, many more. It's humbling, actually. Throughout this year, one of my greatest pleasures has been meeting SO MANY women (and men) out there killing it whether through a creative business like Swell Made Co., running a brick and mortar shop, or anything else you can imagine. Women all around me are living their self-made dreams. It's not easy, but they're doing it well. Working smart, making connections and having passion. So, as Swell Made Co. comes up to one year and hopefully many, many more; I just want to thank ALL of you for believing in me and supporting me in my first year. Sharon at Collected Joy who was one of my first stockists and gave me a crash course in retail. Queenie of Queenie's Cards for keeping motherhood and business real, and sharing a passion for cookies and stationery with me. Stacey at Lovefresh for giving me an opportunity to work with and learn about small, creative businesses. My friend Brandy from Heart + Habit who is so incredibly wise and thoughtful. My friend Christine who is always boundlessly sharing ideas for "fun". Those are just a few! Thank you so much. Each and everyone one of my stockists and collaborators is an inspiration and has provided me with so much wisdom in such a short time. I love hearing all of your stories, visiting your shops when I can (and believe me, I try) and just waking up everyday and working with you. It's a dream come true, but not without tons of smiles, coffee and hustle. They go a long way. That was a bit schmoopy, but what can I say? This is my business baby, and a lot of my heart goes into it so I can support my real babies and their dreams! Coincidentally, we're heading out on a family vacation today. That's not a planned part of celebrating one year, but I'll take it. Have some sage advice or well wishes as I enter my second year? I'd love to hear it. It's time to meet another fab Swell Made Co. stockist. This time we're heading to Lindsay, Ontario to Pretty Little Threads. A newly opened (this past June) and very sweet shop that offers up fashion, accessories, home decor and stationery. It's a fun mix of pretty little things and great brands. Pretty Little Threads is solely owned and operated by girl boss, Jill Trider. Jill grew up in Lindsay, Ontario and always knew she would settle there. After years of living and working in Toronto for a large global brand, she headed home to make her dream of owning a boutique come true. With her past experience in retail, management and marketing; plus her creative talents, Jill created a destination shop that is uniquely her own. Modern, but with a vintage feel. Just look at those displays! Simply put, it's a happy place you MUST visit. She has plans to go online soon, too. Jill lives by this rule every single day. Jill is doing what she loves every single day and it shows at Pretty Little Threads. We love her story and her shop. It's an inspiration for all you girl bosses out there. Find what you love and get out there and crush it, like Jill. She's loving it all and has created a creative and style hub, right at home in Lindsay. Pretty Little Threads is located in the heart of the Kawarthas. The next time you're heading to the cottage, definitely make a side trip to visit this friendly little town and Jill's lovely shop. The fall/winter collections are in and they're gorgeous. Simple beauty in the shop. She's got you covered. Women's fashion and accessories in the heart of Downtown Lindsay. The Chic Canuck tote with Canadian-made goods. It's time to meet another fab Swell Made Co. stockist and we're so proud to introduce The Chic Canuck. The Chic Canuck offers an online shop (and pop-ups) where you can find the best of what Canadian talent has to offer, but it's so much more than that. It's a curated guide to Canadian business, design, travel and style. A trusted space and shop that offers suggestions from what gift to buy for a friend to what to see and eat in Vancouver (and other Canadian cities). They've got you covered from coast-to-coast. They are a tastemaker's guide to Canada. Gracie Carroll and Hana Oh of The Chic Canuck. Founded by Gracie Carroll, she created The Chic Canuck to fill a void in the market that supported the talent that exists within the borders of our own home. She wanted to make it easy for Canadians to support local without sacrificing style or quality. You can see it in her curated collection that is sourced with good taste and pride. "The Chic Canuck was founded by Fashion & Lifestyle Blogger, Gracie Carroll, and a team of true Canucks brought together by their love and enthusiasm for Canada and its homegrown talent. Our individual experiences working, living and travelling abroad, brought all of us a new-found patriotism and affection for our country that grew stronger the longer we were away. As Joni Mitchell would say, sometimes "you don't know what you've got 'til it's gone". Thankfully, we were able to come back. In a country as vast as Canada, and one that is filled with so much talent, we are not only fortunate to have choice and power when it comes to our purchasing decisions, but we have the ability to support great Canadian businesses (big and small) every single day. Did you know that if each of us spent $100 a year more on local businesses instead of chain stores, it would put an extra $3 million a year into our economy? Not only that, but it would also create thousands more jobs every year?". Some goods on their way to a Chic Canuck fan. We share the same commitment to supporting local, Canadian businesses. That's why we're so thrilled to work with The Chic Canuck and join their roster of vetted Canuck brands that include Gold Apothecary, Ella's Natural Botanics, Mary Young, Harlow Skin Co., The Crazy Plate Lady, Said the King and so many more. Not only do they provide a marketplace and a voice for Canada, but they also take time to do good. The Chic Canuck is involved in taking the lead for events with CAMH and Sick Kids throughout the year. Swell Made Co. was honoured to be part of the Darkness to Light night in support of CAMH back in May. They're style is killer and so is their support for all that is entrepreneurial and Canadian. That support fuels dreams and creativity in our humble and beautiful home. So, head over to The Chic Canuck or visit them at their next pop-up and say hello. These girls are are on fire and are destined to be a force in the Canadian retail and publishing industries. Happy Canada Day! There's something strange about a hump day holiday, but we'll take it. Canada, our beautiful country is 148! We've already tapped into the maple syrup with breakfast and our day will include much more Canadiana. We hope you enjoy the day too! As I began to explore the different avenues in which I could express this sentiment, I realized that I had to look no further than my own backyard. I was drawn to the work of amazing Canadian artisans, craftspeople and designers. From this talented group, I was inspired to draw together the people and products that linked together my passion with the essence of being Canadian. Kelly's taste is impeccable and there's a common thread of cuteness, whimsy and of course, Canada. Head over to the Little Blue Canoe to check out Kelly's collection and meet some of Canada's finest. You'll find Swell Made Co. art prints, stationery and totes amongst the goods. We're so honoured and proud to be part of a lineup highlighting so many great Canadian vendors. She'll also feature her vendors and tips on how to put the shop goods to use throughout the year, so watch the blog for ideas and new products. Kelly can't wait to meet you! We'll keep this post short and sweet so you can get out there and enjoy our beautiful home (every stunning corner from sea to sea). Happy Canada Day! Little Blue Canoe is online shop that is anchored in its enthusiasm for the people, products and country we represent.